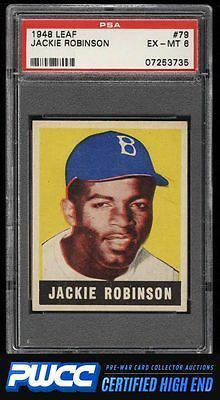 Perhaps the best looking '48 Leaf Robinson RC we've brokered in recent times. Dead centered with square corners and exceptional surfaces for the issue. Very light wear to the corners and a bit of back chipping is all that holds this card back. Still seems worthy of a higher grade. A stunning PSA 6. One of nearly 17,000 cards, lots, and sets up for bid in our 8th Auction of 2016. Click on the link above to view the other PWCC auction lots.